Nursery designs that have been jazzed up using paint techniques on the walls always look stunning, but many moms are nervous to give it a try. The good news is that it's much easier to do than you may think. 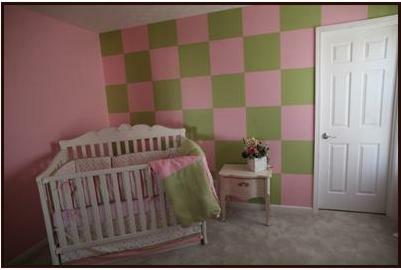 If you want to paint checks or stripes in your nursery, all you need is some patience and a few basic steps. The first thing you need to do is to work out what color you want your stripes to be. You can go for contrasting colors such as pink and brown or you can use different shades of the same color for a more subtle effect. Either way, the bigger the difference between your colors the more like bars your stripes will look. Be careful, you don't want your nursery to end up looking like a cage! If you want high contrast between your stripes, you can minimize the cage effect by only adding stripes to one of your walls, by only painting stripes on the lower half of your walls or by varying the width of your stripes (more on this below). Also bear in mind that you can have more than two colors. See the picture above as an example. And you can use a paint effect such as sponging instead of just a different color. Tip: Remember to test your chosen colors at home in the baby nursery before you start painting. Different lighting conditions affect color appearance and the in store paint chips are not always 100% representative of the end result. First decide where you want to paint your stripes. Will you paint one nursery wall, two or all of them? Just the bottom, just the top or from top to bottom? Then decide how wide your stripes will be. Will they all be the same width? Will the lighter ones be wider than the darker ones? Will the widths be random? Tip: Wider stripes give a more relaxed feel while narrower stripes can give quite a formal effect. 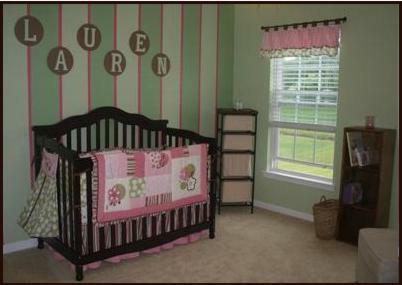 Both will work in a baby nursery as long as they match up with your chosen nursery decorating style. It helps to map things out on a piece of paper so that you can get a big picture of how your nursery design will look. This is the easy part. Just paint the entire area that you want to cover with stripes with your lightest nursery color and allow it to dry for about six hours. You will need a second coat. When this is dry allow it to cure for 2-3 days. 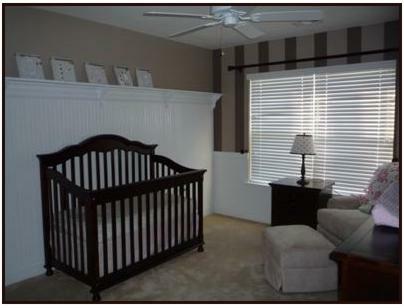 You are now ready to begin learning how to paint stripes in your baby nursery! 1. Measure the total width of the nursery wall you will be painting. If you will be painting more than one wall add their widths together. 2. Decide on the width of your stripe pattern. A stripe pattern starts with your first stripe and ends when the first stripe is repeated. In this nursery picture your stripe pattern will include the white, dark pink, light pink, dark pink, white and blue and then it will start again. In this nursery design the pattern includes dark brown, then light brown and then repeats. 3. Work out a width for each stripe pattern. This width must divide evenly into the width of the space you will be painting. Let's say you want to paint two nursery walls. One measures 36 inches wide, the other 60 inches wide. Your total width is then 96 inches. You choose a pattern width of 7 inches. When you divide 7 into 96 you get 13.714 inches. This tells you that these measurements won't work. You will end up with an incomplete stripe pattern at the end. However 96/8=12 or 96/6=16 so either a 6 inch or an 8 inch pattern will work for a nursery design. 4. 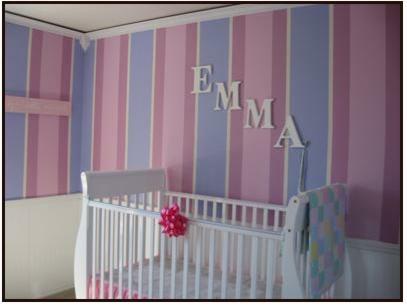 Divide the width you have chosen for your stripe pattern into your different nursery colors. In the blue and pink example above you could make your blue and light pink stripe 2 inches each, your dark pink stripes 1.5 inches each and your white stripes 0.5 inches each for a total of eight inches per pattern. Eight divides into 96 twelve times exactly so you will end up with a perfect stripe distribution in your nursery design. 1. Measure and mark the position of your first stripe (in this case 0.5 inches from the edge of the nursery wall) somewhere near the top of the wall. 2. Using a level make several marks down this line on your wall. The level should make sure that you end up with a straight vertical line. 3. Use chalk to join up all your marks from top to bottom. Now you have your first 0.5 inch stripe to be painted white. 4. Measure 1.5 inches from the line you have just drawn and make a mark. Repeat steps 2 and 3 and you have your second stripe to be painted dark pink. 5. Continue like this until you reach the end of your area to be painted. If you did your calculations correctly, your stripe pattern should end perfectly at the edge of your painting area. Use low tack painters tape to mask off the areas to be painted first. Remember to place your tape on the outside of the stripe to be painted, alongside the chalk line, not on top of it. Once your tape is up, wipe away any chalk or pencil lines before painting your nursery wall. If you are painting with only two nursery colors like the brown stripes nursery above then you will be finished when these stripes are painted. However, if you are attempting something more adventurous like the pinks and blues above then you will need to let your first set of stripes cure for 2-3 days before beginning the taping process again for the next set of stripes. Blocks are simple to create step-by-step. Paint the nursery wall with your base color. Choose a shape (square or rectangular). Choose a size using the calculation guidelines discussed above under stripes. In this case you will have to work out a size that divides evenly into both your nursery wall width and height. (Note: Bigger usually works better than smaller). Measure your blocks out using a level. Mark the lines on the wall with a pencil. Tape down one side of the lines with masking tape. (You must tape down the same side of each line otherwise your blocks will end up being different sizes). Paint your blocks in your chosen baby nursery colors. Remove the painters tape before the paint is dry. Note: if you want to avoid the checker-board effect that one often gets when block painting you can try using three colors rather than two. I hope that the information on this page has given you an idea of how to paint stripes in your baby nursery. It will take you a little bit of extra time and effort, but the result will be stunning and very worthwhile!